I’ve always liked the idea of Jet Set Radio. I liked the concept, I liked the style, and I liked the really wacky and colourful character art. Yet every time I sat down to play it, I could never wrap my head around controlling it. The whole thing just felt so stiff and constricted, which is weird in a game that’s about rebel teens spraying graffiti over their town while doing crazy tricks on rocket skates. I never got my hands on Future, so maybe it fared better, but in the several hours I attempted to play Jet Set Radio I just couldn’t get into it. Even if on the box and in the reviews it’s exactly the kind of game I was looking for at the time. 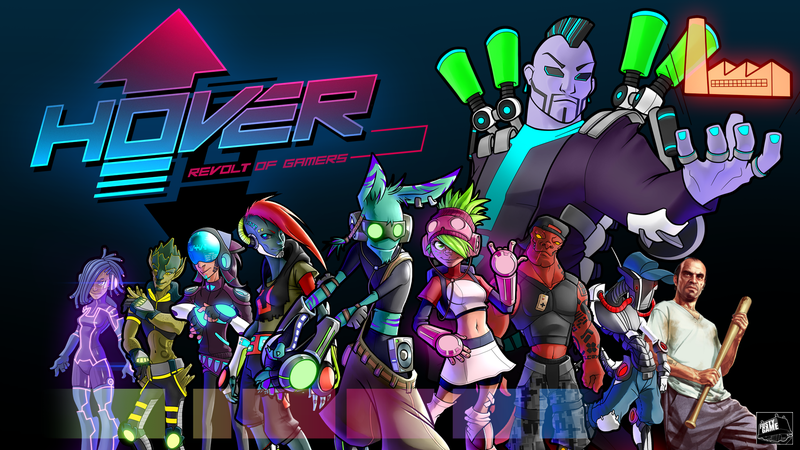 I didn’t really take note of Hover: Revolt of Gamers until after it launched. Maybe I lost interest in the concept or maybe the fact that the story revolves around a gang that actually call themselves “Gamers” and are fighting a war against a literal Fun Police, which is cringe-worthy on just about every level imaginable. Playing through the story didn’t change my opinion of the story at all, even if the banter between the characters was entertaining (and frankly it just made the darker segments all the more jarring). But that minor gripe aside, from the moment I downloaded the game and got past the tutorial… I had a blast. Hover is constantly referred to as a spiritual successor to Jet Set Radio and it wears that title almost obnoxiously. You’ve got the vibrant colours and sound track, graffiti, stunts and skating, rebels being rebels, et cetera. The only things different were that, for one, the controls were amazing and super responsive, which immediately got me hooked after I struggled to enjoy Jet Set Radio. The other thing was something that got me by surprise, especially from an Indie game. The open world was genuinely amazing. Bet you I can make the j- Oh, crap! I used to be a big fan of open world games, but lately the more I play them the more I realize just how empty they all seem to be. True, there are outliers such as Dying Light (which you should play even if you’re sick of zombies), but the vast majority of them seem like stretches of randomly generated terrain with some buildings plopped in for good measure. There’s no real sense of exploration in a lot of them, and the obstacles you face in the open world primarily exist to prevent you from starting a mission, rather than completing it, by forcing you to slog through a whole lot of nothing before you get to the good part. And even then, a lot of the missions end up being a lot of same old, same old, just with slightly different backdrops whilst the foreground is usually the same time and time again. All the missions are set up as time-based platformers, so the variety is given almost solely in the location missions take place. The driving force of any platformer, regardless of the gameplay mechanics, is the level design: it has to be meticulous, varied, and interesting, which is something that open world games simply don’t normally have the resources to do, between cost and engine optimization, to say nothing of the possibility of exploits and such. Yet nearly all of Hover’s missions take place in the open world, which has a shocking amount of detail and the most verticality I’ve seen in a game in a long time. One game you could be racing while jumping from building to building in quick succession, and the other running along the superhighway consisting almost entirely of grind rails and speed boosts. You can be playing Gameball in a standard arena reminiscent of a basketball court, or in a makeshift arena where the two nets are on completely different floors. Iiii’ve been grindin’ on the raaaail-roaaad~! And it works! While in the open world everything feels like a natural, open world game for you explore, yet while you’re in missions, segments can feel like they’re part of a carefully designed level created explicitly for the current mission you undertook, and yet there was no level transition to a unique area for that particular mission. In fact, the missions which actually take place in the open world are considerably better constructed for platformers and much more visually appealing than the few linear mission levels, like the tutorial and the E-Cop office. Those linear missions genuinely feel like half-assed corridors that have no soul to or structure to them at all, which is kind of ironic as that’s the primary gripe with open world titles among naysayers. Some of the linear levels are just a lot of this. Granted there’s not a lot in the way of setpieces or level shifting puzzles like in the Mario series, but what is there is rock solid, both when you’re doing missions or just goofing off in the open world. The level of detail is astounding. Every single scrap heap, wall, and even clothesline seems deliberately placed for the player to use to finish their objectives, and it’s genuinely hard to tell if the open world came first or the missions did, or something in between. And the world still looks like a believable place amidst all that, even if it’s otherworldly and the story is just far too silly for its own good (and no, that last part is not a compliment). I can’t remember the last time I played an open world with genuinely great level design. I feel that’s what open worlds should really strive to be: not just a hub for you to take missions or a means of bragging about how much square kilometers you have, but an active part of the game and its level design. Open worlds could be so much more than merely a backdrop, and while not all games are platformer and others take open world approach to new heights in different ways (like Breath of the Wild and having the ability to climb just short of literally everything), they don’t have to be just empty, shapeless sandboxes, either. Of course, none of this is to say anything about Hover: Revolt of Gamers as a game overall in comparison to other open world games. I haven’t finished it yet so I can’t really review it, but I can tell you that what I played so far I thoroughly enjoyed, even if there’s a bunch of room for improvement. And there is a lot of room for improvement, including patching some game breaking bugs in the online mode which actively cancel missions you are currently in. Not to mention the insane difficulty spike in the Sewer act and that the game seriously suffers from a bad case of “information overload” making it difficult to find your way around a number of areas. But I’m more than confident in saying that, as an open world game, Hover in my mind is without a shadow of a doubt one of the best. Heck, I’d even say it’s neck and neck with Breath of the Wild in terms of open world structure. Now if only it had grappling hooks. What game do you think has the best open world? In what sense: level design or otherwise? Share below!